While offensive line isn’t exactly the Falcons’ biggest position of need at the moment (they are desperate for defensive line help), I decided to go with Cody Ford at pick 14, a player the Falcons had been linked to throughout the combine and reportedly whom the Falcons have major interest in. Ford is the nasty, gritty interior (or exterior, depending on which position needs a starter) lineman that they have been lacking since the loss of more stable players such as Chris Chester and both offensive guard Andy Levitre and offensive tackle Ryan Schraeder. While the recent signings of guards Jamon Brown and James Carpenter may prevent one from even thinking of adding more power up front in the draft, there is definitely still room for improvement at each position along the line. Ford is light on his feet and has the nasty presence that Dan Quinn is searching for this offseason. Although he may not immediately be considered the starter upon arrival in Atlanta, he will most likely be placed in a competition with current starting tackle Ty Sambrailo. There is no questioning Ford’s talent and he could be the main anchor of the Falcons’ offensive line for years to come. The Falcons are in need of an eventual Desmond Trufant replacement and what better option than recent draft board-climber Nasir Adderley out of Delaware. While he has spent the majority of his college career at free safety, Adderley would fit in perfectly as a slot corner in the Falcons’ scheme (for the time being). Coming out of Delaware, Adderley was a commander on defense registering 48 tackles and 3 interceptions as a Senior. Imagine a Falcons defense, with a rather good secondary, adding one more member that not only could serve as a starting slot corner for the time being but also as Desmond Trufant’s replacement down the line. Adderley is an absolute beast and is worth trading the extra picks to bring him in on defense. Now that you have gotten out your frustration of my lack of defensive line picks in the first two rounds, I have some late round goodies for you. A player that the Falcons have recently shown interest in, Dogbe is all the Falcons want in a player: fast, physical, and athletic. Not truly coming on until his senior year, Dogbe finished his career at Temple with 158 total tackles, 19.5 tackles for loss, and 8.5 sacks (7 coming during his final season). Dogbe could be the perfect pass rushing defensive tackle that the Falcons need and would fit in from day one. Wow—double dipping on the defensive line? While both Mack and Dogbe are late round players, a combination of them and Grady Jarrett can prove to be a formidable force in the NFL. Mack is the hulk-sized compliment to Dogbe’s more Drax-like figure. Don’t be fooled though. Mack’s size (336 pounds) is made up for by his speed (5.1 forty yard dash time), strength (30 bench press reps), and his elite get-off and powerful first punch. With time, Mack could be a perfect rotational piece to compliment the more starting-caliber, pass-rushing defensive tackle in Michael Dogbe. :Now, to some, this may be a very ill-advised selection. Picking another tight end when the Falcons already have Austin Hooper, a proven talent, and Eric Saubert, a developmental player who has plenty of upside, sounds absolutely crazy. Well, with the Falcons having a bit more wiggle room with their later selections, they could opt to find a replacement for Saubert as he has not been what they had hoped he would be since his arrival in the league. Also, with the signing of blocking tight end Luke Stocker, the Falcons may be pressed to find some real pass catching talent in a player like Foster Moreau out of LSU (especially due to the belief that Stocker will be used more as a fullback in the Falcons’ scheme). Moreau ended his collegiate career with 629 yards and 6 touchdowns, a stat line that fits the billing of a later round gem. Moreau can double as a blocking and receiving tight end as he was utilized greatly in the run blocking game at LSU and also has the frame and RAC ability of a quality rotational receiving tight end. This pick is definitely a personal favorite of mine. There have been rumors that the Falcons are very interested in Mecole Hardman Jr. out of the University of Georgia, a phenomenal kick returner and deep threat receiver. How could the Falcons improve the pass game? Well, simply add another deep threat of course! Not only does Hardman have the potential to be the best Falcons kick returner since Devin Hester but he also can help to take the attention off of the bigger targets on the field (Julio Jones and Mohamed Sanu mainly) with his sheer speed alone. At times last season, Hardman looked like a better receiver than his UGA teammate Riley Ridley, brother of Calvin Ridley. This would be the perfect late-round pick for solidifying both special teams and depth at wide receiver. With their last pick in the 2019 NFL Draft, the Falcons pick for more depth and more security. Lonnie Johnson Jr. is an experimental type cornerback that could come in and immediately make an impact rotating in and out with second round pick Nasir Adderley. Johnson, while not putting up many notable stats (only 1 interception in his collegiate career, albeit he only has two seasons under his belt), can still be a worthwhile investment in the fifth round for a defensive back needy team. After all, there isn’t such a thing as too much depth. This draft is all about potential. Each player has such a high ceiling and can benefit the Falcons in the long term, no doubt about it. While all of these picks might not be spot on, these players will most definitely be on the minds of the Falcons front office when looking who to select at each spot. Leave a comment below and let me know what you think the Falcons will do in the upcoming draft! 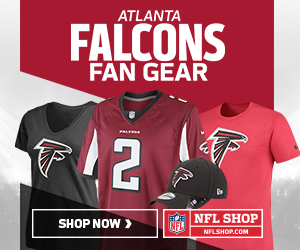 ← What Lies Ahead for the Falcons in the Draft?